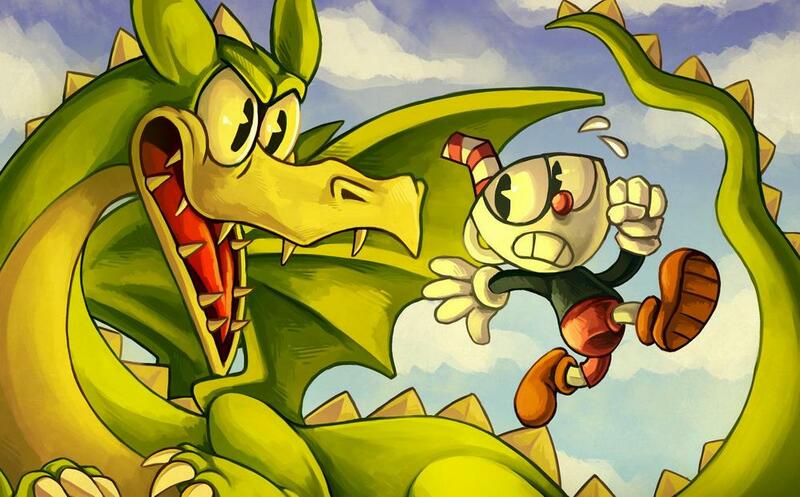 Grim Matchstick is one of the hardest bosses for some people in Inkwell Isle 2. I'll tell you what to use and what to do. Use The Lobber and Peashooter.Charms are your choice. Grim Matchstick always starts off using his little laser eye attack.The last ring is always parryable so try to parry it for the extra power cards.Don't feel like you're wasting power ups.Just use your power moves whenever you can.Try not to get too close as the fireball might hit you and it's best to leave the tail behind you so you have room to move out of the way of his attacks.Use Your Lobber mostly to get most the damage done. In The Second Phase,Grim decides to move to the left of the screen.It can be inconvenient due to the clouds always moving you towards the danger rather than how it would move you away from Grim in the first phase.Grim himself doesn't attack you directly but releases fire from his nose to the far left of the screen meaning you can't just stay above him.It'll signal it when smoke comes out of his nose.He'll also let out his tongue releasing walking fireballs.Try to stay at the top of the screen.The fireballs can unpredictable of how high they'll jump so it's best to just stay at the top so you already know how high they're going to jump.The fireball that jumps is always the one who has an evil grin and pointy teeth.Not every one of the fireballs looking like that will jump,but none of the others jump.They'll also signal which one jumps by a movement one does which looks like it's crouching for a jump and you'll hear a little giggle.The way it's facing will choose which way it jumps so if you hear a giggle,look at which one is going to jump and what direction they're facing.Use The Lobber Only Because You'll Be At The Top Of The Screen causing you to land most your hits. The final phase is a nightmare if you don't know what to do.This time,You'll want to refrain from overusing the Lobber.Use mostly the peashooter.He'll shoot fireballs at you which if shot at,will explode and 4 fireballs will go right,down,and up.There's one that goes left but that one pretty much never hits you.I recommend using the peashooter because it goes in a straight direction meaning you'll know if it'll hit and if you should jump,while the lobber can be unpredictable whether it'll hit or not and when to jump.If you hear a weird sound(sorry.I can't find a word to describe it)that means Grim's head in the middle will turn into a flamethrower and cover the middle screen with fire,stop,then fill it again.I recommend using your lobber now due to Grim not firing those fireball that will split if shot and you should stick to the top of the clouds.If you can't get there in time without being damaged,just stick to the bottom.It's more of a fight about who can hold out longer more than a battle of who can do the most damage.I recommend using the invincibility super.It can get you out of a jam if you need to use it.